Our 2018 flower calendar is fully customizable to make a unique personalized gift. 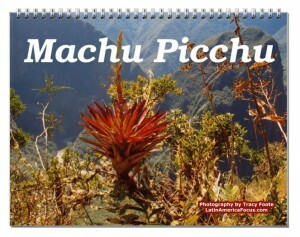 This nature calendar captures the foliage found in the Sacred Valley of Peru. When planning my trips, I always add at least a half an hour to the time stated in travel books. If it is an hour climb, that means at least an hour and a half for a climbing photographer. Hiking the trails along the ruins of Pisac and Machu Pichu is a photographer’s dream. Some of my favorite images are displayed in this calendar. October: Remember to look down in the shadowed forest on the bank of the Putucusi climb. You might catch a glipse of purple fallen from a tree. November: As you stop to breathe in oxygen at high altitude, bend down and try a close-up shot of more pink blossoms. December: Look up. Has the sky ever been so blue? And look, there’s another splash of pin extending above your head.